This Malagasy woman scene is one of a set of 14 paintings on woven raffia used by LMS missionary John T Jones to illustrate his talks about Madagascar when on home leave in the UK. The paintings are presumed to have been commissioned from a Malagasy artist for this purpose, probably for his 1936-38 home trip. LMS missionary John Thomas Jones (known as 'JT') worked in Madagascar from 1922 to 1951. He and his wife Emily (n�e Bowen), who had trained as a nurse, were both from Carmarthenshire and together they set up the mission station at Mandritsara. Emily bore three sons, but after the last in 1926 she fell ill and died while being carried by Malagasy locals to Imerimandroso to see a mission doctor from Antananarivo. After this, it was agreed that JT should give up his Mandritsara station and continue working from Imerimandroso. The youngest son died of dysentery the same year, and then the following March there was a severe cyclone in which the mission house collapsed, killing the second son Victor along with Rev Thomas Baldwin Lees and two Malagasy members of the household. JT, his eldest son Edryd, and the wife of Rev Lees survived the disaster. Very soon afterwards, JT remarried in Antananarivo with a French Protestant Mission (MPF) teacher called Madeline Hipeau, who had also been in Madagascar since 1922, and together they had a daughter and a son. JT died suddenly from heart problems whilst on leave in England in 1952, having completed arrangements to return to Madagascar against his doctor's advice. 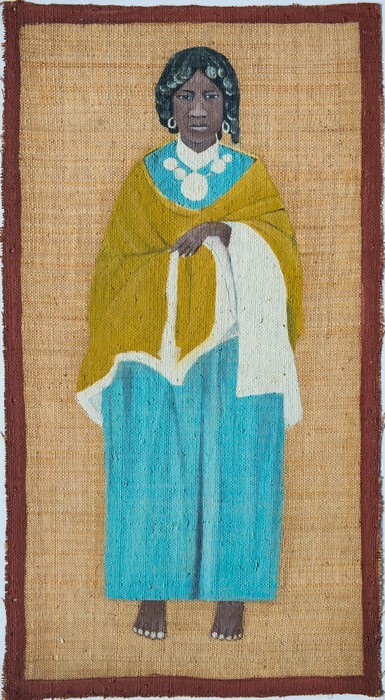 His son from Madeline, Philip Jones, who ultimately inherited this set of paintings, entrusted them to the care of the Madagascar Library in 2016, recalling that he had always known the paintings to be kept in a tight roll tied with a length of raffia and stored in a small attach� case along with his father's stationery. This item was kindly donated to the Madagascar Library collection by Philip Jones.